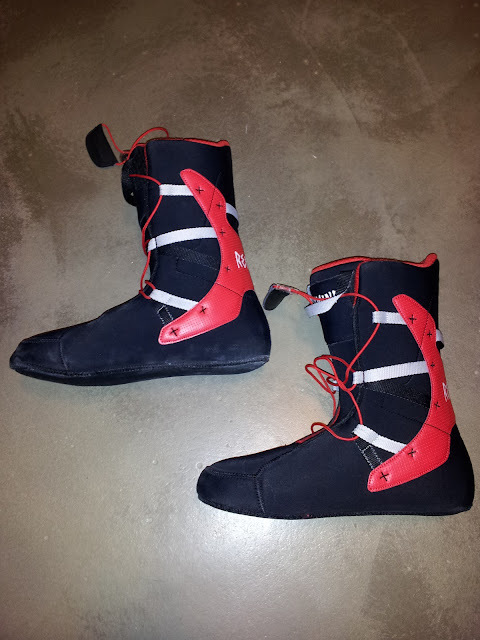 Boots are the most important part of your snowboard kit. Nothing will send you limping to the lodge faster than a pair of ill-fitting kicks. So what do you do when your favorite boots pack out and turn into your worst nightmare? Check out Remind Insoles' new liners: The Solution. Let Remind give you the stinky details. Function: Get ready for support. The Solution is for riders seeking a stiffer flex with extra arch support. They come with Remind Insoles wich have more support and cushioning than your stock insoles, too. This all adds up to more support than you're used to from snowboard boot liners. These liners are extra-easy to install, too. In the two pairs of boots I tried, it was harder to pull out the old liner than it was to put the new one in. This with no extra heel lift. 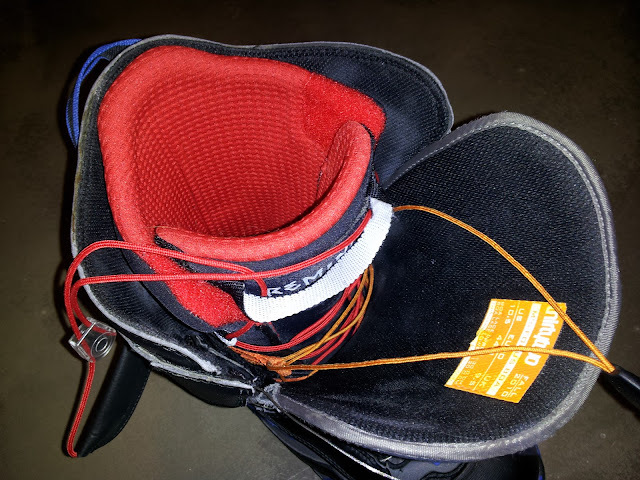 The liner remains locked to the boot shell and your heel stays seated in the liner. If you have boots where the liners are fused to the boot shell, obviously, The Solution will not fit. You need to be able to remove your old liners to insert these. They do, however, work with boots that have the liner laces attached to the shell, like the 32 Focus Boas pictured below. You end up with two sets of liner laces, but it still works. Tighten as many of them as you need. Whatever you do, don't cut the red wire! One spot where The Solution could use some work is on the liner lace. I feel like they have a futuristic liner with a lace from the past. Small potatoes, but it's something they could improve for next year. Maybe a lock-down more like Salomon uses. I didn't do any long-term testing, but Remind claims these liners never pack out. I tested them about 10 days and some other liners would pack out a little in that time, but The Solution didn't. The did break in a little and get more flexible, but the internal volume feels the same. Speaking of which, these liners feature a snug heel with a slightly roomier forefoot. Comfy. Oh yeah, I broke out the food scale and weighted these bad boys (and my girlfriend just busted me for it). The Solution came in at 10 3/8 oz., the Salomon at 12 1/8 and the 32 at 9 1/4. All numbers are per liner with insole. Of course, 32 has the lace attached to the boot and the others' are attached to the liner. Not the sort of weight you're going to notice, unless you're that guy who obsesses over that stuff. You know that guy. Don't be that guy. Speaking of the food scale, Remind touts the antimicrobial properties of the fabric used for both The Solution and their insoles. I didn't hear the microbes rioting, but I did ride three days in a row in them and still drove home without a clothespin over my nose. Full disclosure: I also used these every night. Regardless, they passed the sniff test at the end of the day. Fashion: The Solution is actually about as fashionable as a boot liner - an article that's made to be covered up while in use - can be. They are bright red inside and the insoles (reviewed separately) come in an array of art and color. Floating eyeballs, yetis, tie dye; none are bland. The red beacon will let you know which boots are yours at a crowded cabin from down the hallway and across the living room. The insole art will be a nice little personal gift when you slide into and out of your boots. Bottom Line: If you have jacked up feet and need extra support, The Solution is for you. For me, it was more support than I needed, so I went back to my Salomon liners with the Remind Cush insoles in them. Perfect. If the liner packs out any more, I know where to find The Solution. When it comes to ballet flat shoes, there are really two choices - leather and canvas. You could also choose imitation leather shoes, but these won't usually work well, and they wear out quickly. So really, your two choices are leather or canvas ballet flat shoes. I find a website for the Insoles for Work Boots. If you want you can visit this site.